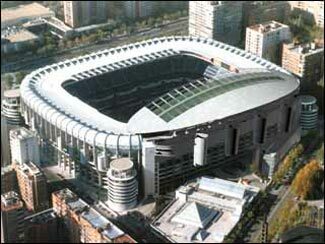 The Real Madrid stadium is more commonly known by the name of its founder, Santiago Bernabeu, and is used to host Real Madrid´s 1st team matches and the occasional concert. Located in the Northern centre of the city on the side of the main North - South Paseo de la Castellana the stadium is well conected by both Madrid´s Metro and Bus systems. 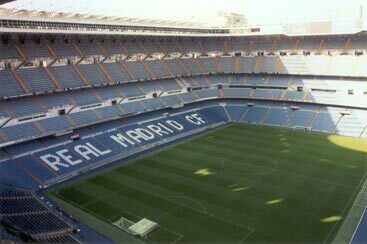 Whilst the site has been used for football since 1902 it was only when Santiago Bernabeu took over the club presidency that the present day Real Madrid stadium came into being (see here for club history). In 1947 the current stadium was inaugarated with a match between Real Madrid and Belenses. 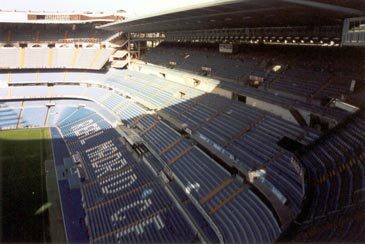 The 1947 stadium, and indeed its evolution to what we see today, was down to the then forward thinking of Santiago Bernabeu. He saw a Madrid public that had suffered through the Spanish civil war and wanted to give the city something to cheer as well as a monument to the city´s greatness. His plan was for a two tier stadium of 55,000 capacity which many thought to be excessive and way ahead of anything else in Spain at that time. Santiago believed correctly that if a stadium of such size was built people would come just to see the stadium and would want to be associated with it. Thus when 10 year guaranteed seats and or terrace entrances went on sale the 1st "bond" scheme entered into football history. The original two tiers are still in use today although they have been heavily adapted to make the stadium all seater as well as provide TV and concession stand services. So as not to impact on the then neighbouring residential community the 1st tier of the Real Madrid stadium was excavated below ground level. This being the case the exterior superfiche still astounds many 1st time visitors who cannot believe the stadium capacity when viewing from the outside. Regular further development has seen tiers being added and the stadium remodeled as land became available. The latest addition to the stadium was completed in 2005 when 5,000 extra seats were added to the East side of the stadium as shown here. Real Madrid offer a tour of the Stadium on non-match days excepting the day after a match which allows the non football minded the chance to see the stadium at a cheaper rate than a match day ticket would. 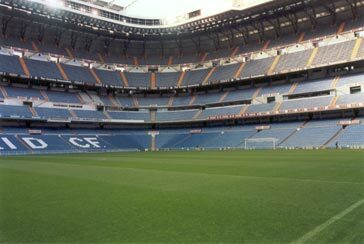 For a detailed description of the tour see our detailed Santiago Bernabeu tour guide! A cheaper option, depending on your appetite is to take a meal in the Real Madrid stadium cafe which can be accessed on the south side of the stadium near entrance door 30 and affords a pitchside view. The cafe offers both a Spanish and contintental menu. 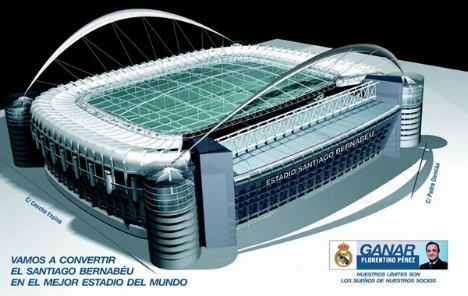 In his time as chairman of the club Florentino Perez circulated plans for the enclosing of the stadium santiago bernabeu. Although this has now been on the backburner for a while it has yet to be discounted and the present chairman, Calderon, has stated that he is looking at improving the stadium further although would not commit to a timeframe. Some photos used in this article are provided by www.stadiumguide.com. A website covering Europes major stadiums.